Table Mountain National Park is proud to host the Prologue of the 2018 Absa Cape Epic. When the 20km time trial takes place on Sunday 18 March, all eyes will be on this Natural New 7 Wonder of the World as riders battle it out for prime position. With unforgiving climbs, lightning fast descents and technical single-track, the 2018 Prologue sets the scene for the seven stages of the Absa Cape Epic to follow. But the route’s breathtaking views of the city below and the rugged peaks towering above also highlight the unique appeal of this national park. Although Table Mountain National Park lies on the doorstep of the bustling city of Cape Town, it’s a pristine natural area, simultaneously a haven for indigenous fauna and flora and a wild sanctuary for city dwellers. Stretching 70km from Signall Hill to Cape Point, the park offers unparallelled opportunities to enjoy fresh air, take part in outdoor activities and appreciate the Cape Peninsula’s natural beauty. A Natural World Heritage Site, Table Mountain National Park forms part of the Cape Floral Kingdom, the smallest and richest floral kingdom on Earth. More than 2 200 species of plants grow in the park, among them the king protea, South Africa’s national flower. The park is a wonderland for birders and home to animals such as duiker, caracal and klipspringer. It’s no wonder Table Mountain National Park draws more than 4 million visits every year. Tourists take the cableway to the top for panoramic views, journey to Cape Point to stand at the tip of the peninsula and call at Boulders Beach to watch the endangered African penguin in its element. For active sorts it is a paradise, with a myriad of hiking trails, beaches, tidal pools, rock climbing routes, dive sites and surfing spots. Mountain bikers are well catered for with six designated areas and a variety of routes to appeal to avid riders and weekend warriors alike. From the steep slopes of Tokai to the dramatic vistas of Silvermine, the mountain-bking routes in Table Mountain National Park offer an unforgettable experience. An annual My Activity Permit Level 3, available from the Tokai Office, permits cyclists to use the park’s cycling routes. “One day is not enough to experience this rich and varied national park. 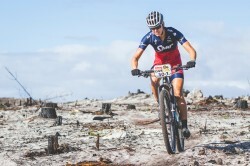 We invite riders in the Absa Cape Epic to return and explore every corner of it,” says Clementine Mbatani, SANParks Regional Tourism and Marketing Manager.